We offer Twin Blade Chamfering nad OD Turning Tool. It is easy, safe and stable clamping. Strong body design for optimum cutting parameters. Chamfering Tools are used for Chamfering the flank edges of spur and helical cylindrical gears prevents edge distortion during heat treatment and protects the tooth profile against any nicks that may occur during handling. Application: ~55HRC / Iron, Carbon steel, Cast Iron, Alloy Steel, Tool Steel, Heat treatment Steel, Welding Steel. To furnish the diverse requirements of our clients in the best possible manner we are involved in offering an extensive range of Chamfering Tools. In order to cater the diverse requirements of our customers, we are involved in offering a quality range of Chamfering Tool. These products are hardened and ensure longer flawlessness with excellence. Chamfering Tool has high tensile strength and is widely known for their excellent finish. Chamfering tool is used to sharpen & smoothen the edges of 40mm & 14mm HDPE Duct used in telecom Fiber Optics deployment. Using Chamfering tool two end of HDPE Duct can be couple/Joint firmly using Duct Coupler. 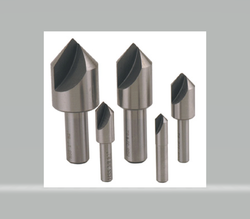 We are involved in manufacturing of Indexable Chamfer Tools. These are fabricated using high grade stainless steel and brazed carbide materials for corrosion resistant finish and high tensile strength. We offer chamfer cutters in multiple angles and sizes for use in various CNC and VMC machines. Being a noteworthy business enterprise, we are readily indulged in presenting to our customers Insert Type Chamfer Tools. Tools for chamfering of marble and granite tiles and other such applications. its bevel angle can also be adjusted as per requirement. This Chamfering tool is used for Chamfering and bevelling of PVC Pipes used for Laying Optical Fiber Cables.